Posted by M Bharath Bhushan in 29th State, Culture, Economy, Essays, Identity, politics, regionalism, Telangana, Telangana People, Telugu (తెలుగు). Posted by M Bharath Bhushan in Art, Culture, displacement, ecology, Economy, Essays, heritage, Identity, livelihoods, Pochampalli, Telangana, TRS. Posted by M Bharath Bhushan in Adilabad, Chenchu, Culture, displacement, ecology, Economy, Godavari, Gond, heritage, Identity, Khammam, Koya, Mahabubnagar, Polavaram, Settler, Warangal. According to the census of 2011, Adivasis account for 9.34% of the total population in Telangana. Posted by M Bharath Bhushan in corruption, ecology, Economy, Harish, KCR, Medak, submergence, suicide, violence. SANGAREDDY: The Mallanna Sagar project oustees agitation took a ‘bloody’ turn on Sunday with police caning the villagers, resulting in injuries to dozens of people. Police opened fire in the air and lobbed tear gas shells to bring the situation under control. All Opposition parties called for Medak district bandh on Monday protesting against the police action against the villagers. It is alleged that the police caned the villagers, including women and children indiscriminately, and even dragged people out of their houses and beat them up. Two of the submergence villages, Erravelli and Vemulaghat, resembled war zone with the locals fighting a pitched battle with police throughout most part of the day. Trouble began when some villagers of Vemulaghat, who were on a 50-day relay hunger strike against the Mallanna Sagar project, tried to lay siege to national highway protesting the government’s attitude in going ahead with the project inspite of objection from locals. Posted by M Bharath Bhushan in agitation, displacement, ecology, Economy, Harish, KCR, Medak, suicide, Telangana. Rahul to visit Mallanna Sagar villages? Hyderabad: Will AICC vice president Rahul Gandhi make a surprise visit to Telangana and join the party’s fight in support of Mallanna Sagar project oustees demand of compensation as per Land Acquisition Act 2013? Yes, say highly placed sources in the Congress party. Like in the University of Hyderabad protests during the suicide of Dalit scholar Rohith Vemula, Rahul Gandhi is likely to make a surprise visit to the state and the proposed submergence villages under Mallanna Sagar project. Posted by M Bharath Bhushan in agitation, displacement, Economy, heritage, KCR, landuse, livelihoods, politics, SC, ST, submergence, TDP, Telangana, TRS, YSR. Known for his staunch belief in ancient Hindu customs, Telangana chief minister K Chandrasekhar Rao is all set to appease Lord Vishnu in a big way. He is preparing for yet another major Vedic ceremony, this time to apparently ward off ‘evil forces causing hurdles’ in implementing government programmes. Preparations are on for KCR performing the Sudarshana Yagam in his assembly constituency in Medak district next month. The detailed religious ritual will be held at Gajwel on August 7 to invoke Sudarshana, the mythological disc associated with Lord Vishnu in decimating evil forces. Posted by M Bharath Bhushan in Adilabad, Bonalu, Culture, Economy, Gond, Lambada, politics, ST, Telangana. 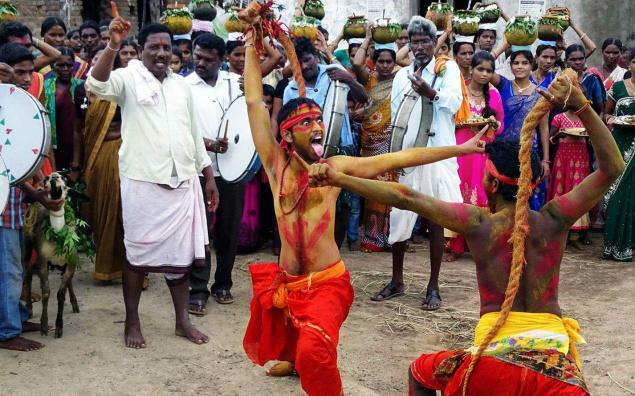 It may not be too long before the Banjaras of Adilabad district, popularly known as Lambadas, get completely assimilated into local Telangana culture given the speed with which changes are being adopted by the community. Posted by M Bharath Bhushan in Andhrapreneurship, Economy, Hyderabad, Karimnagar, Medak, Nalgonda, Nizamabad, politics, Rangareddy, Settler, Telangana, Warangal. 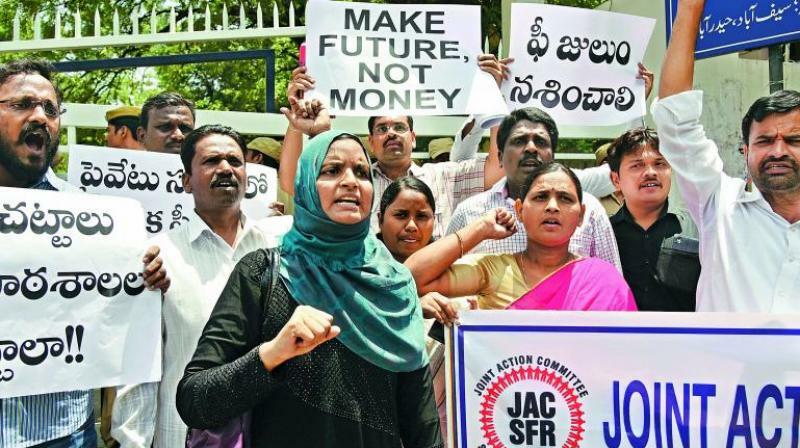 School Fee Regulation JAC member Nagati Narayana said the issue was not confined to Hyderabad. Hyderabad: The fight against exorbitant fees charged by private schools has spread to the districts, with student unions undertaking protests. Posted by M Bharath Bhushan in attrocities, Culture, Economy, politics, Reddy, regionalism, Telangana, Velama. 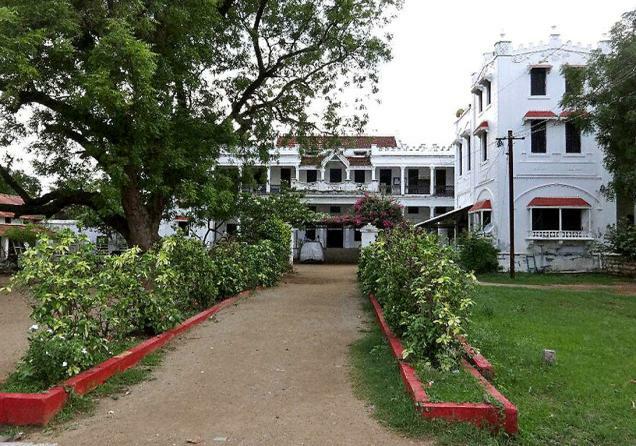 The awe-inspiring symbol of feudal power, Manor houses, locally known as Ghadi which are found across Telangana have faded into oblivion. Ghadis are dwelling places of people who had wielded power on local communities during and after Nizam’s era in Telangana districts. Usually a feudal lord owned thousands of acres of land and had under his control over half a dozen villages and even more. The feudal lords belonged to all castes, mostly upper castes – Reddy, Brahmin and Velama communities. Posted by M Bharath Bhushan in 29th State, Adilabad, Economy, Hyderabad, Identity, Karimnagar, KCR, Khammam, Mahabubnagar, Medak, Nalgonda, Nizamabad, politics, Rangareddy, regionalism, Telangana, Warangal. 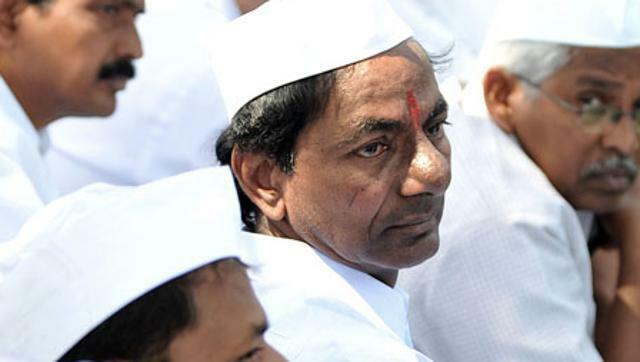 Reorganisation of districts will strengthen K. Chandrasekhar Rao and his party TRS in south, east. Hyderabad: The reorganisation of districts in Telangana state could lead to exclusive zones for the TRS, while edging out the Opposition in some of the proposed districts in the southern and eastern parts of the state. The TRS has been traditionally strong in the northern districts and Warangal, while it is considerably weak in Ranga Reddy, Mahbubnagar, Nalgonda and Khammam. Mahbubnagar district will be split into three parts — Mahbubnagar, Wanaparthy and Nagar Kurnool. As per proposals, Wanaparthy district would have Alampur, Gadwal and Wanaparthy from where the TRS has no MLA. The district will become a stronghold of the Congress. The residual Mahbubnagar district will have Maktal, Narayanpet, De-varakadra, Jadcherla, Shadnagar, Mahbubna-gar and Kodangal. Of these, only Kodangal has a representative from the Telugu Desam. With this, the residual Mahbubnagar district would become a stronghold of the ruling party.